After a months-long review, the Mayor has concluded the work of a special commission developed to review public monuments in New York City. As a response to protests around the country, Mayor Bill deBlasio assigned a special panel–independent of the Public Design Commission–which weighs in on public art to consider any “symbols of hate” in parks and on our public streets. Some of the more contentious monuments fall within LANDMARK WEST!’s catchment zone, of 59th to 110th Streets, and Riverside Park through Central Park–both, scenic landmarks. 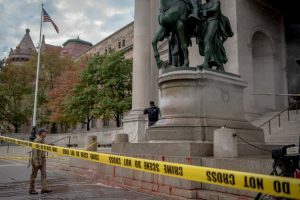 The Christopher Columbus statue atop a rostal column in his namesake circle will remain despite doubt placed by the mayor himself some months ago. The Theodore Roosevelt monument outside his namesake hall at the American Museum of Natural History fronting on Central Park West will also remain, despite protest of its representation of Native and African Americans. The boot goes to Dr. J. Marion Sims who developed many advances in gynecology but did so by operating on African American women sans anesthesia. He will be relocated from Central Park to Greenwood Cemetery in Brooklyn, which is his also his grave site. Read all about these decisions in The New York Times. Both about the full review in Half-Measures Won’t Erase the Painful Past of our Monuments as well as No Traveling for New York’s Columbus Statue, Mayor Decides.